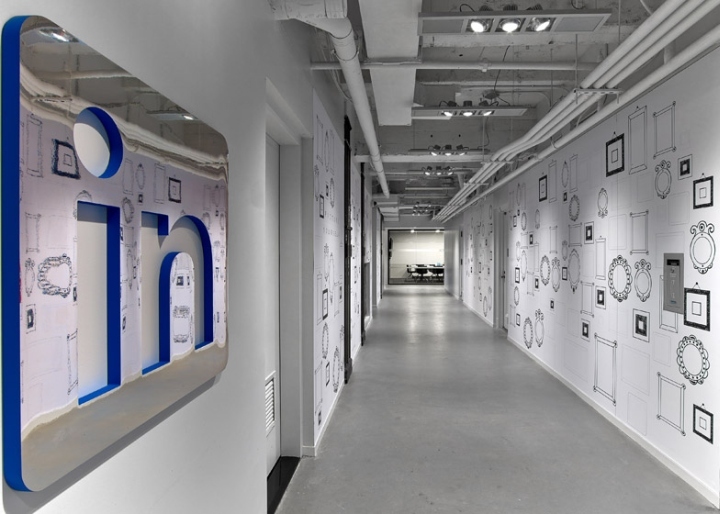 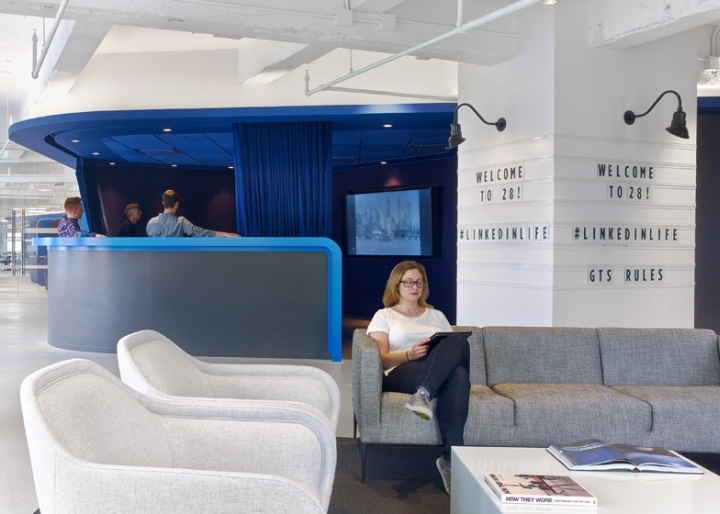 Social network LinkedIn‘s offices in New York’s Empire State Building include a room lined with vintage telephones that leads to a secret bar. 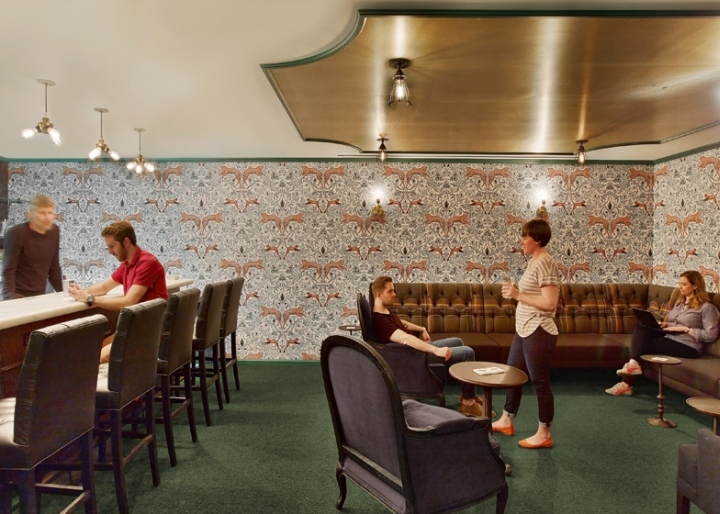 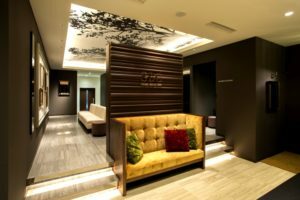 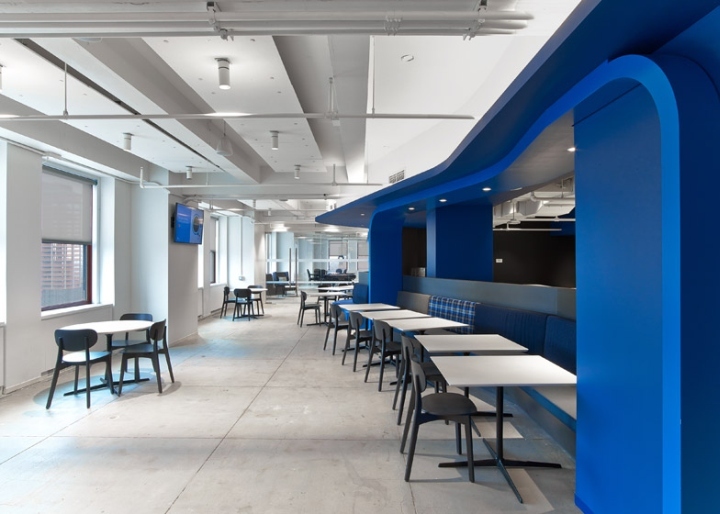 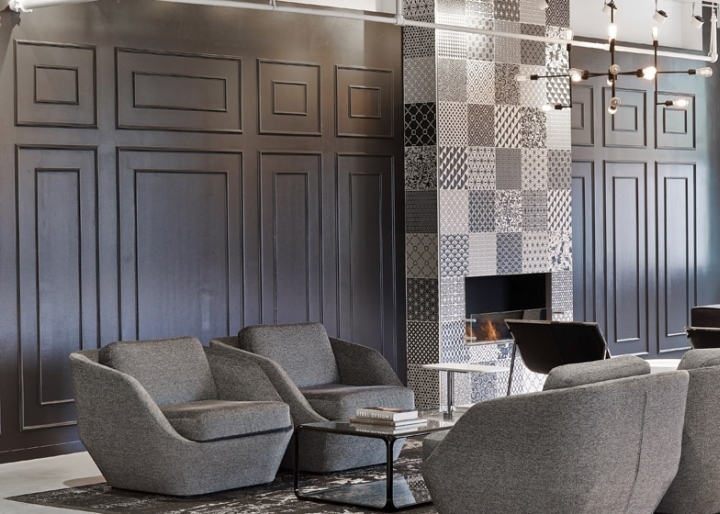 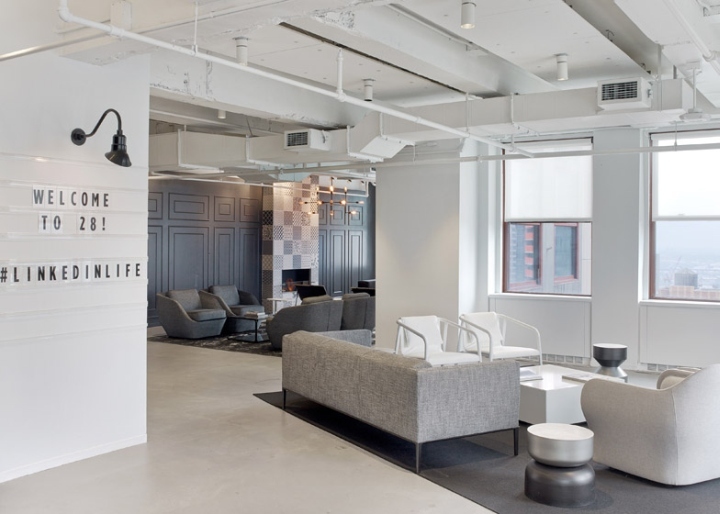 The entire floor is treated as a “club level” and recreation space for employees, with amenities such as billiard tables and a screening room, as well as a speakeasy. 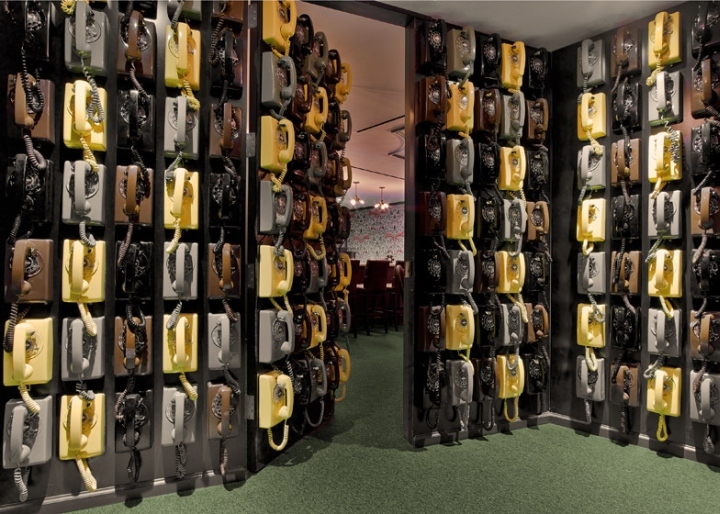 The hidden room is accessed via a vestibule that is covered with 133 rotary telephones. 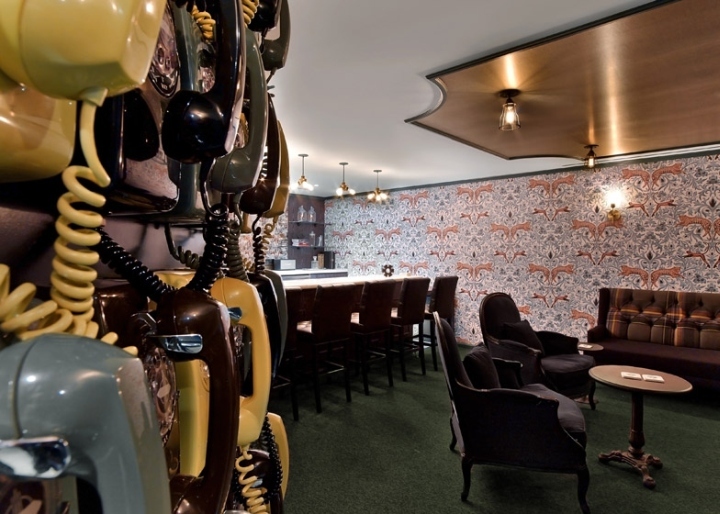 One of the phones unlocks a concealed door when the receiver is lifted off and replaced, allowing visitors to enter the bar area decorated with patterned wallpaper and an eclectic mix of furniture. 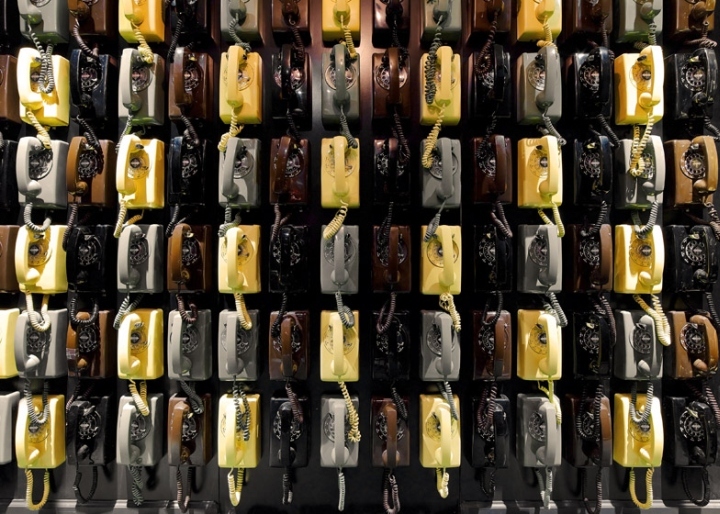 “If you’re not sure which phone it is, you can call it with a number passed through the office by word of mouth,” Helman Foley said. 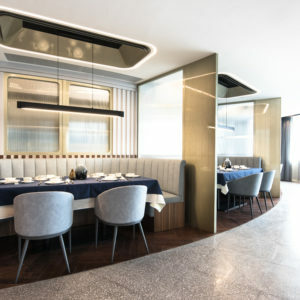 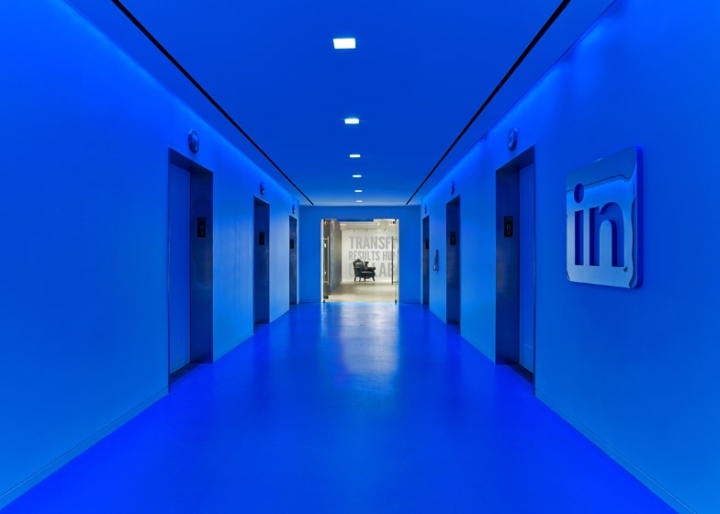 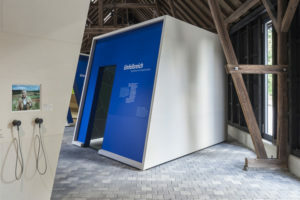 Bright blue was used to cover all of the surfaces in the central lift lobby, from which a feature wall in the same colour forms a ribbon around the communal areas. 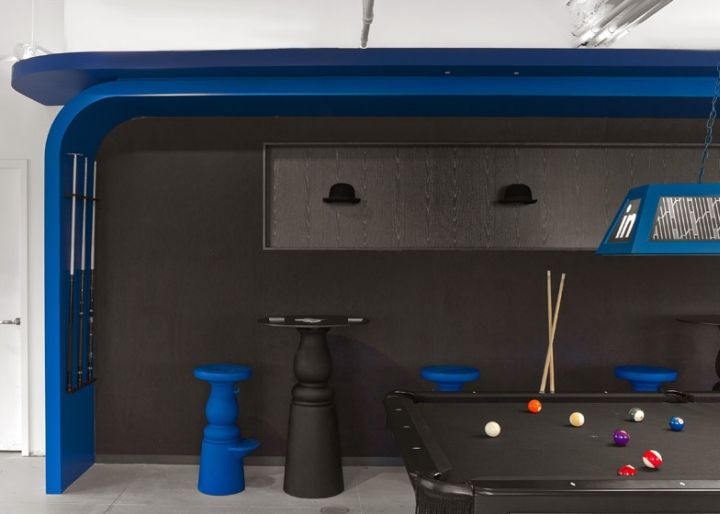 In different areas, this element incorporates a built-in seating unit, a gallery and a storage area for billiard equipment, until it terminates as the ceiling for the screening room. 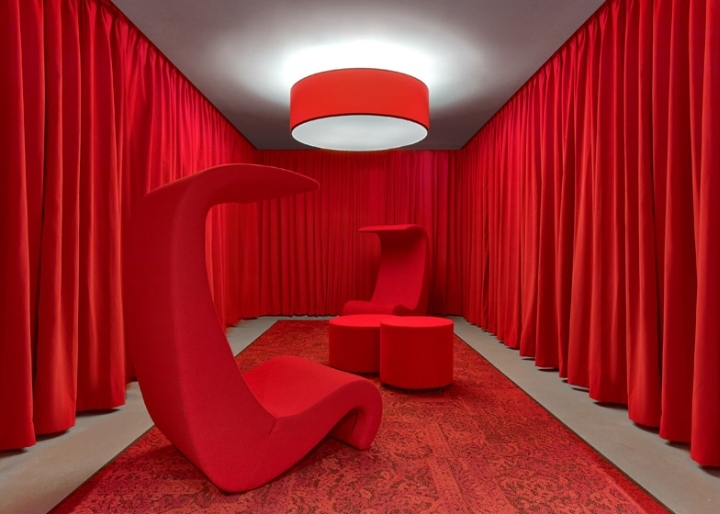 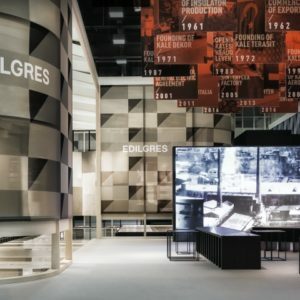 The rest of the spaces largely follow a black, white and grey colour palette, although an informal meeting area is surrounded by bright red curtains that match a carpet, the furniture and a lampshade. 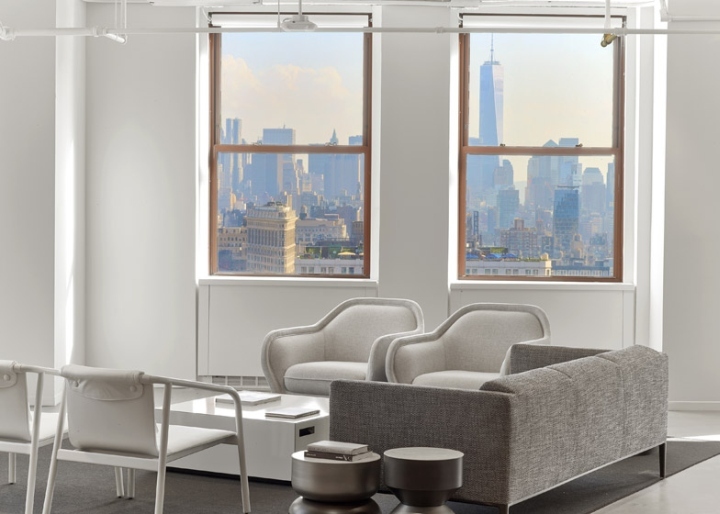 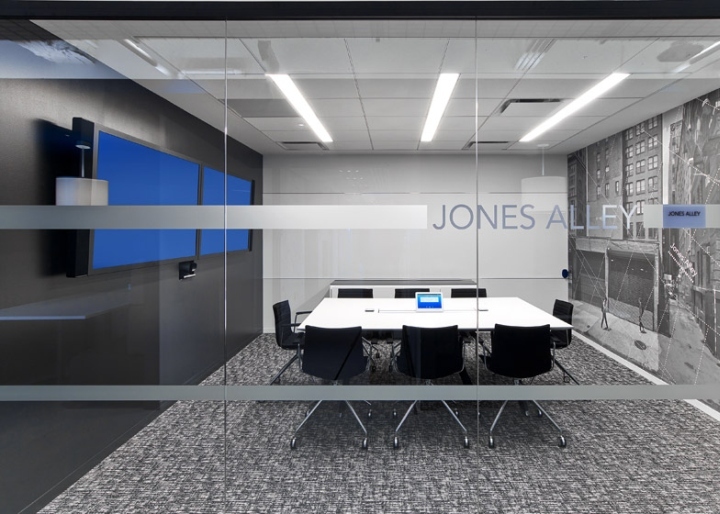 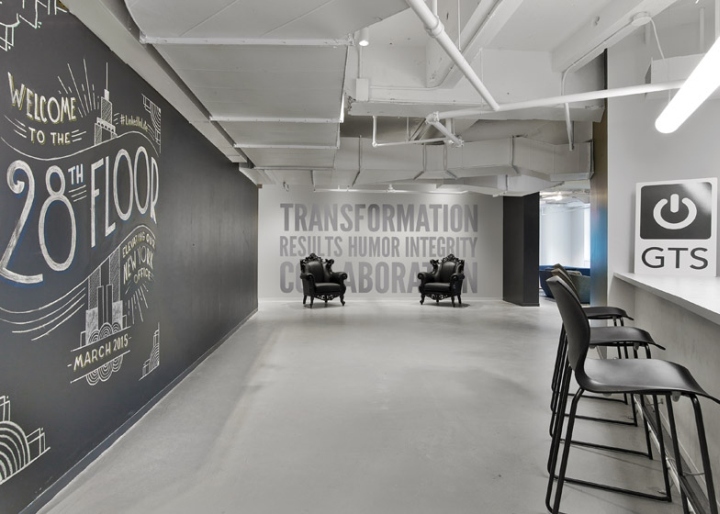 Formal meeting rooms are more sombre, fronted by glazed walls and decorated with floor-to-ceiling photographs of New York alleyways. 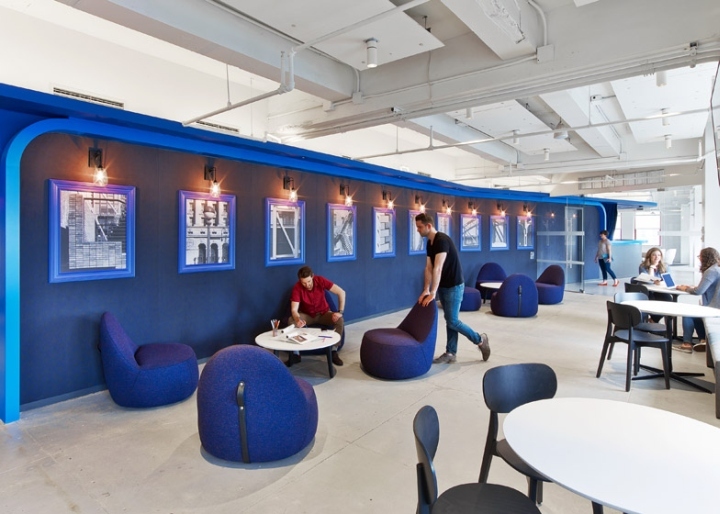 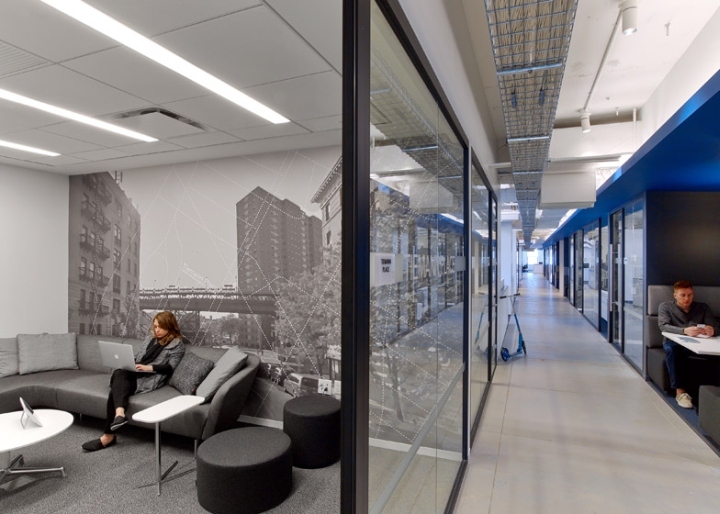 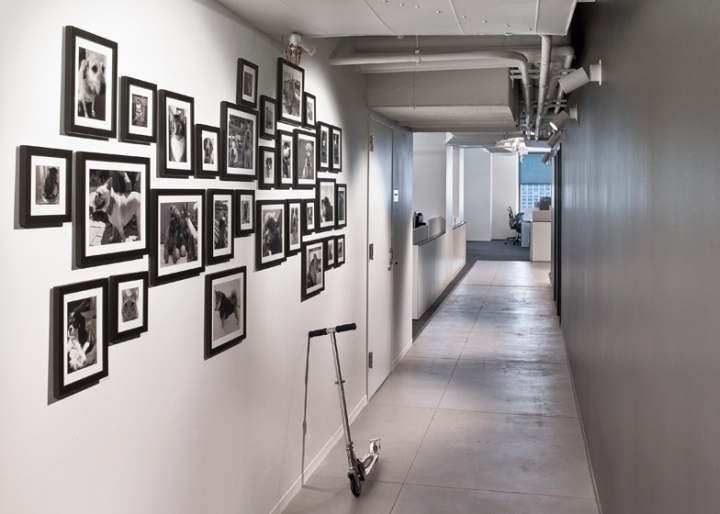 Along this route, one wall is decorated with black and white photographs of employees’ pets, while drawings of empty picture frames run down another white corridor. 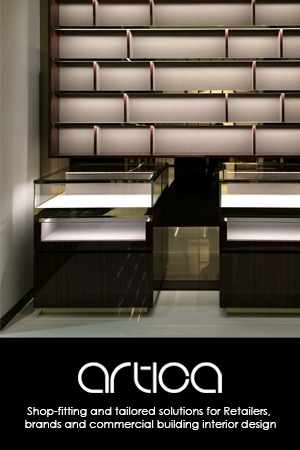 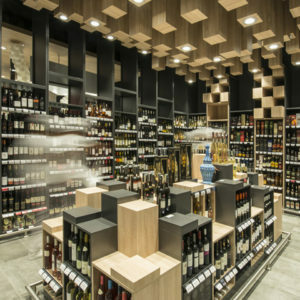 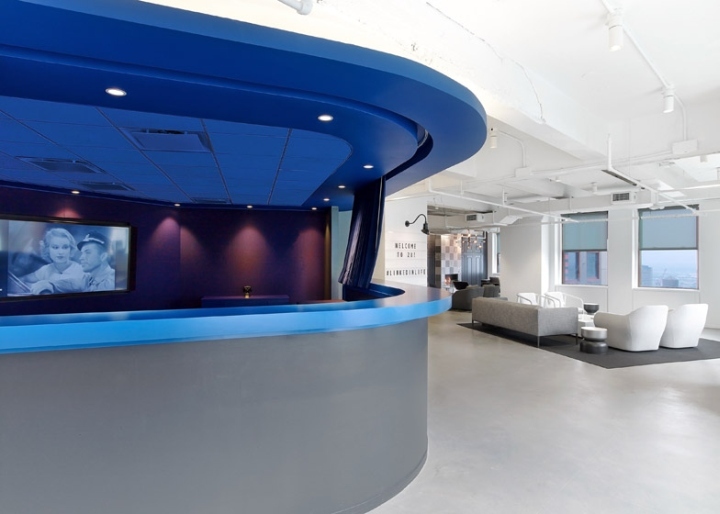 A linear indigo ceiling fixture is designed to help visitors navigate back to the circulation core.